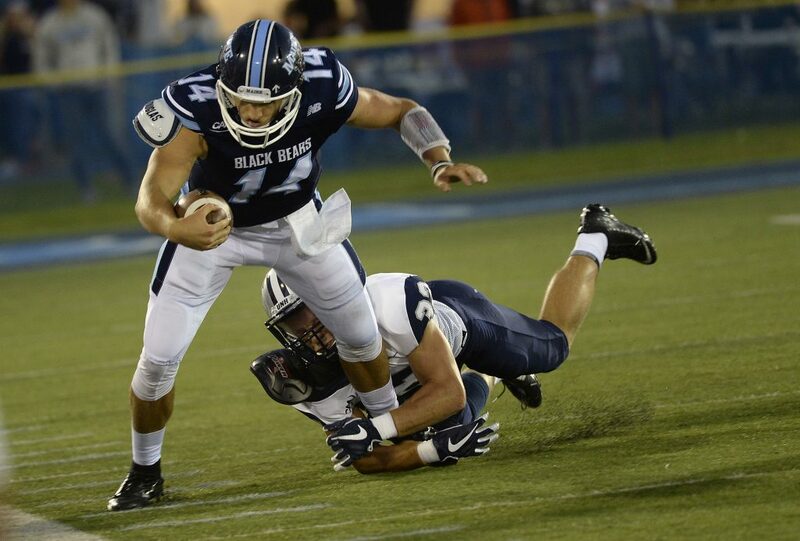 The Black Bears snap an eight-game losing streak to the Wildcats, dominating the game in all phases. ORONO — Joe Harasymiak always says it’s important to visualize what you’re going to do, to imagine your success. 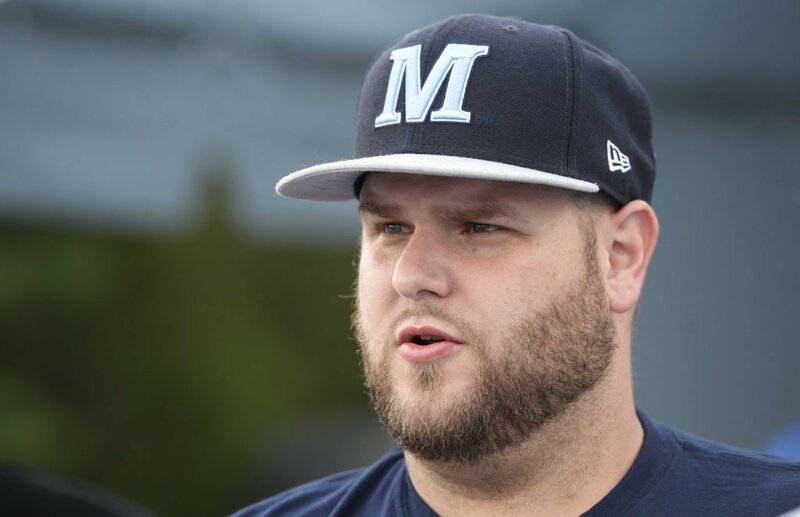 But even he couldn’t have foreseen what his University of Maine did Thursday night at Alfond Stadium. 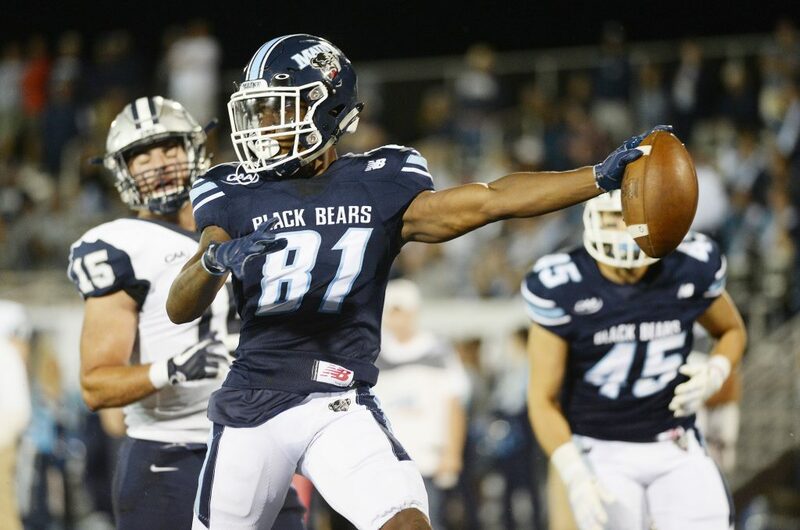 The Black Bears absolutely dominated nationally-ranked rival New Hampshire, ending an eight-game losing streak to the Wildcats with a stunning 35-7 opening game win. Maine out-gained the Wildcats 450 yards to 116, piled up six quarterback sacks and put its offensive versatility on full display. It was Maine’s first win over New Hampshire since 2010, and only its second since 2002. The Wildcats, ranked in the top 10 in both Football Championship Subdivision national polls, had won 15 of the previous 16 games between the schools. 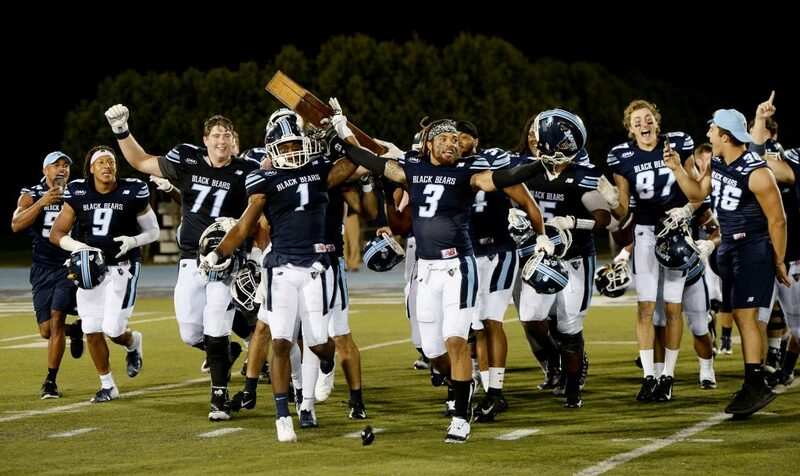 The Black Bears paraded the Brice-Cowell musket – the trophy annually given to the winning team in this rivalry – for long minutes on the field after the game, players dancing behind it. 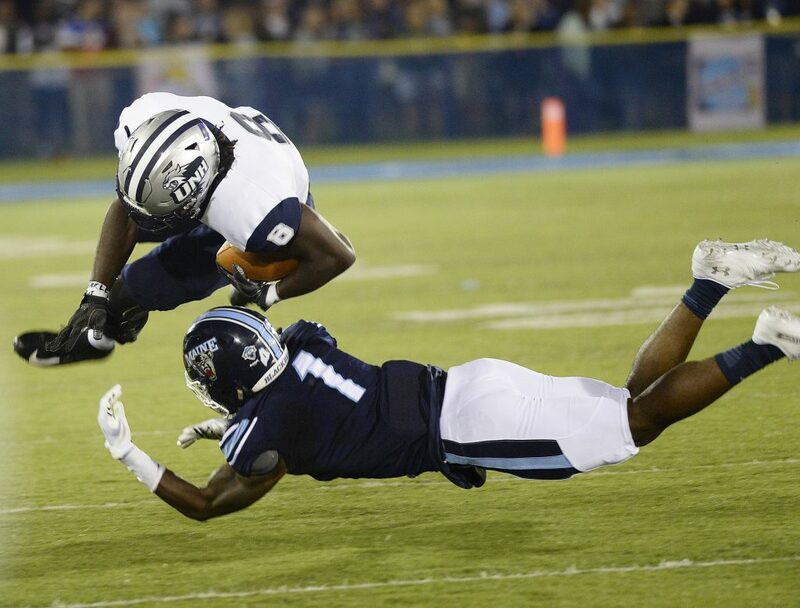 “It’s undescribable,” said Maine senior wide receiver Micah Wright, who scored Maine’s first touchdown on a 6-yard pass from Chris Ferguson just four seconds into the second quarter. “I’ve waited for this moment ever since I got here. I’ve been dreaming about this (game) since last November. Maine took control with 22 points in the second quarter, an 11-yard touchdown pass from Ferguson to Earnest Edwards completing a 99-yard drive with 10 seconds remaining in the half. 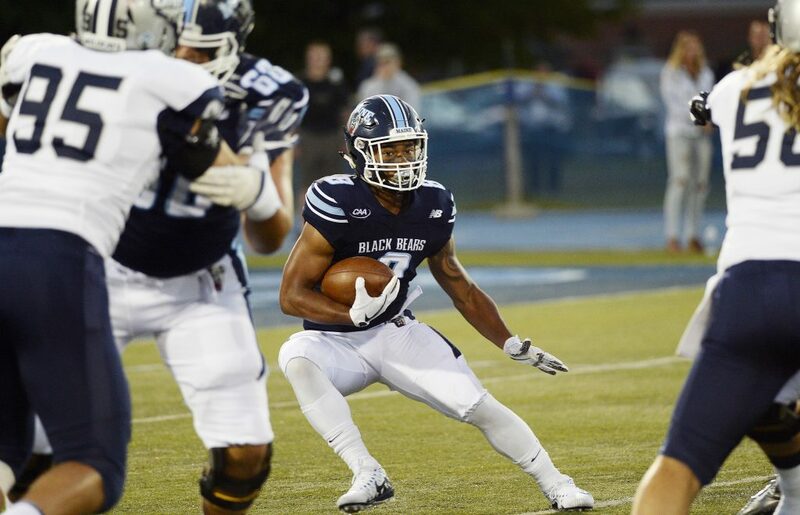 The Black Bears rushed for 199 yards, threw for another 251, displaying the versatility and balance that they hope will become their trademark. Ferguson completed 21 of 31 passes for 199 yards and two touchdowns. Edwards scored two touchdowns, one on a 17-yard run, the other on the 11-yard pass. Joe Fitzpatrick rushed for 78 yards and a 14-yard touchdown in which he hurdled a would-be tackler at the 10 and rumbled into the end zone. Ramon Jefferson rushed for 74 yards. Wright caught four passes for 55 yards and a touchdown. And tight end Drew Belcher, who lost the quarterback battle to Ferguson a year ago, threw a 52-yard touchdown pass to Jaquan Blair in the third quarter, while also catching a team-high five passes for 34 yards. 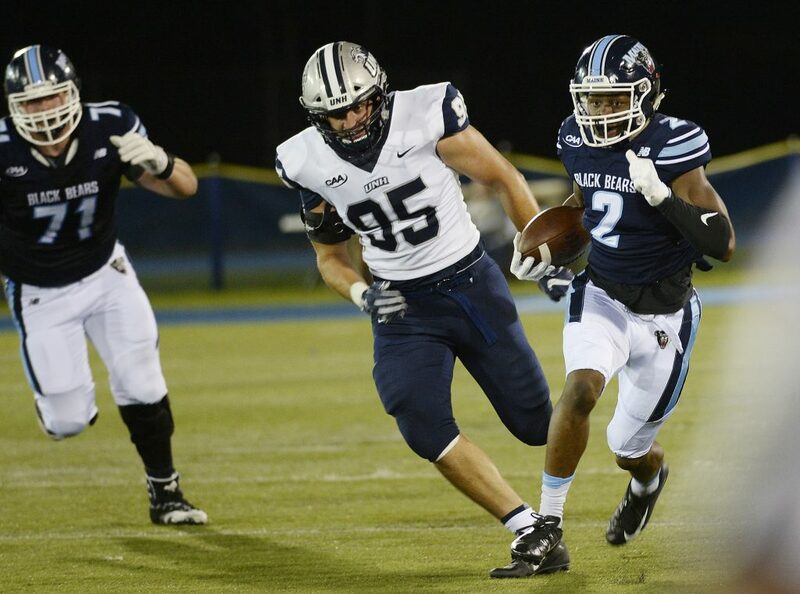 “Terrific job by the University of Maine,” said New Hampshire coach Sean McDonnell. “Well-prepared team, well coached. They did everything, everything, better than the University of New Hampshire today. The Wildcats were hampered by the loss of senior quarterback Trevor Knight in the second quarter. 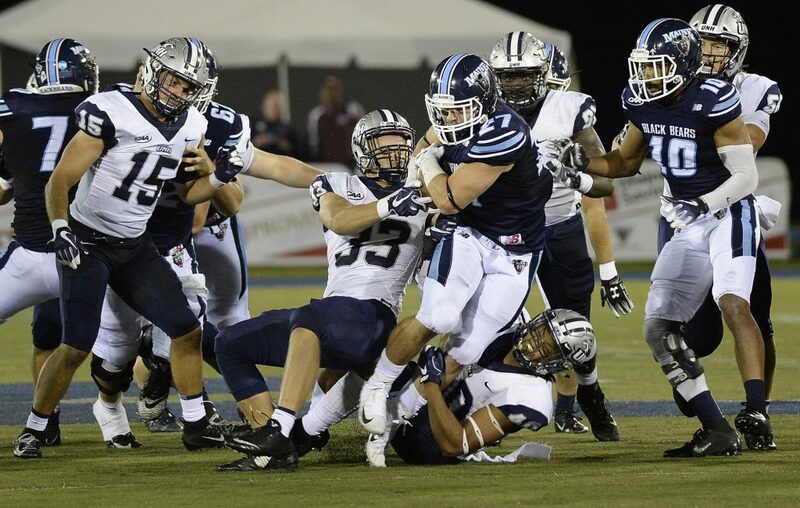 Knight, the Colonial Athletic Association preseason offensive player of the year, suffered a right shoulder injury. But Maine’s defense was ready for anything. Sterling Sheffield set the tone with two 10-yard sacks in the first quarter. 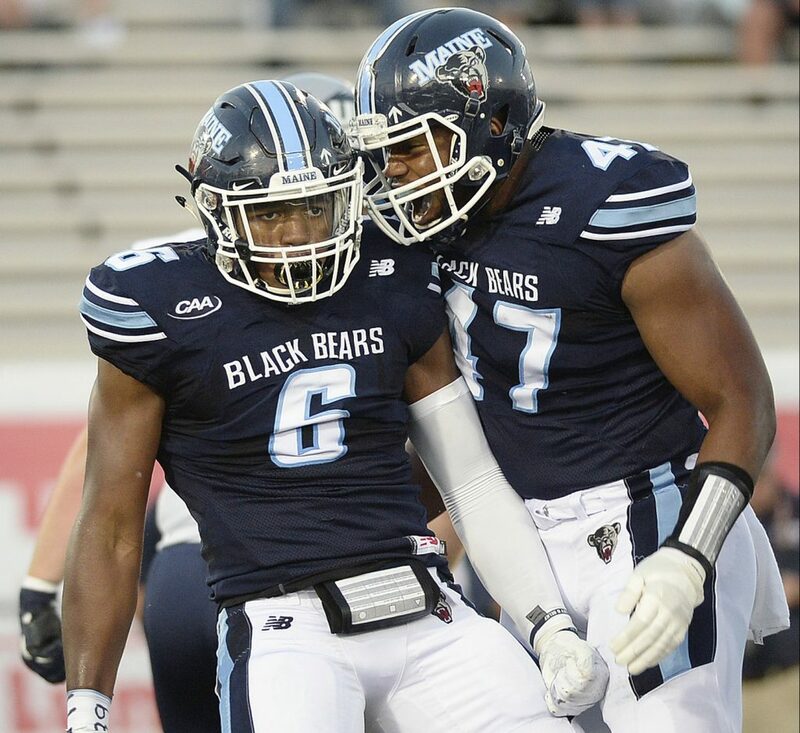 From there, the Black Bears simply took over. 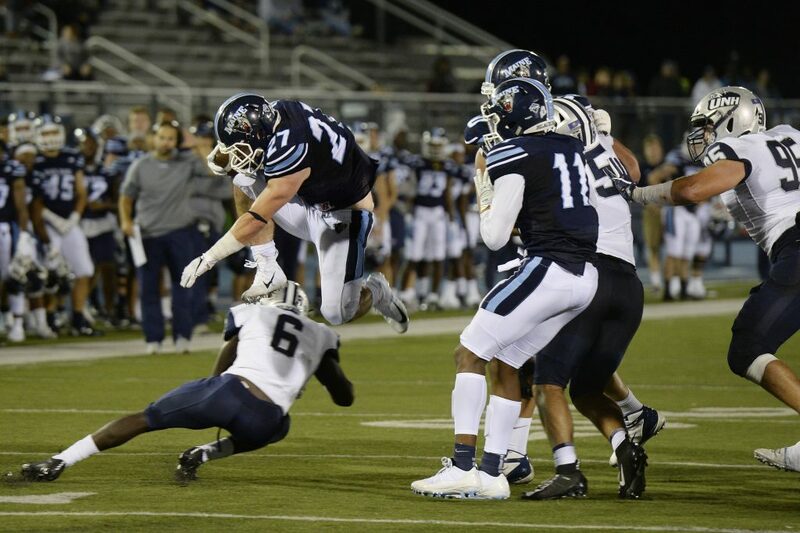 New Hampshire had minus-7 rushing yards in the game, standout wide receiver Neil O’Connor was held to two catches and its three quarterbacks were harassed all night. Charles Mitchell had 2.5 sacks, while linebackers Deshawn Stevens (eight tackles) and Taji Lowe (seven) took away any attempt to run the ball. Offensively, Maine got the ball to its playmakers as much as possible, using quick screens or jet sweeps to get the ball into the hands of its wide receivers. Eight different receivers caught passes from Ferguson. Five players ran the ball. New Hampshire linebacker Quinlen Dean said Maine had the Wildcats on their heels the entire game. “They just threw more punches at us and we were catching them,” he said. The decisive drive came late in the second quarter. Maine led 16-0 when it got the ball on its 1 with 2:15 left. Two runs by Fitzpatrick got the ball out to the 23. A 15-yard penalty on New Hampshire moved it to the 38. Then on third-and-8, Jefferson took a draw play 49 yards to the New Hampshire 11, cutting to the left and away from the defense. Two plays later, Ferguson threw a touchdown pass to Edwards with 10 seconds left in the half and it was stunningly 22-0. 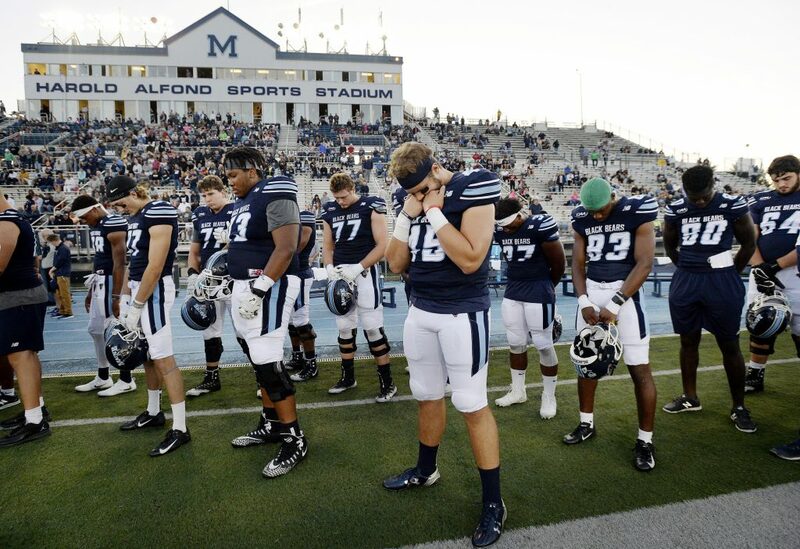 NOTES: The Black Bears held a moment of silence in memory of Darius Minor, the 18-year-old freshman defensive back who died from a rare heart condition during a workout July 24. Maine ran a montage of photos of Minor on its scoreboard throughout the pregame warmups. In addition, Maine’s helmets bear a decal with his number (39). Eighteen members of Minor’s family attended the game, driving up from Virgina. Five of them were on the field for the moment of silence and, when it was over, Coach Joe Harasymiak went over and hugged each one. “The family is staying together,” said Rob Otey, a cousin from Locust Grove, Virgina. “As you can see, we travel in numbers. We want to represent Bubby (Minor’s nickname) as he deserves. He deserved nothing but the best and that’s why we came here to honor him and to be here for him.” Otey said the family has appreciated everything that the university has done for it since the tragedy. 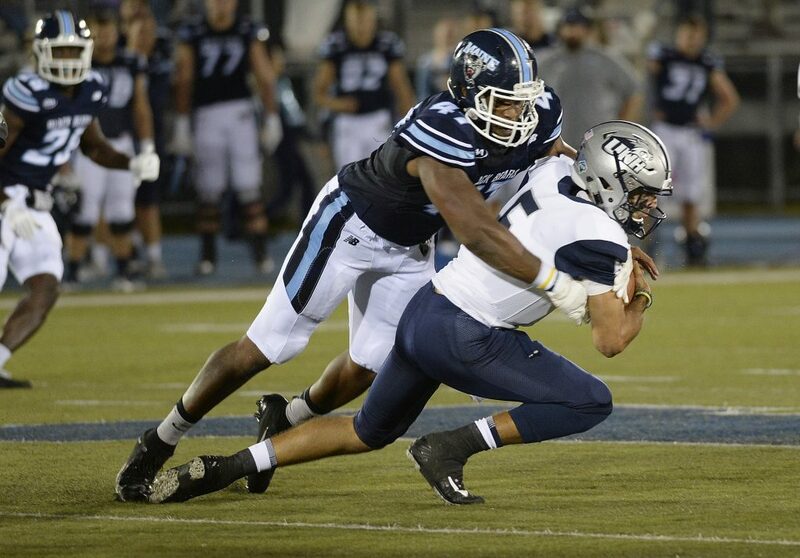 … New Hampshire was without junior wide receiver Malik Love, who has a hamstring injury. Love was the Wildcats’ second-leading receiver last year with 70 catches … Edwards was ejected from the game in the third quarter when he received his second unsportsmanlike conduct penalty. He took his helmet off in celebration of Blair’s touchdown catch from Belcher.